You’ve stumbled across one of the best automotive options on the island! Welcome to Nissan Motor Corp in Guam, your destination for any and all Nissan needs in Tamuning and the surrounding area. We pride ourselves on offering the best automotive experience possible regardless of your needs. If you’re looking to buy or lease a new Nissan car, truck or SUV, then we have the inventory you need. If what you need is a pre-owned vehicle from any manufacturer or simply need to get your Nissan vehicle serviced, we’d be happy to help. Feel free to browse around our site to find the information you need, but don’t hesitate to give us call if you can’t find it. Our sales staff is full of experience and looking forward to helping you out with whatever you’re looking for. 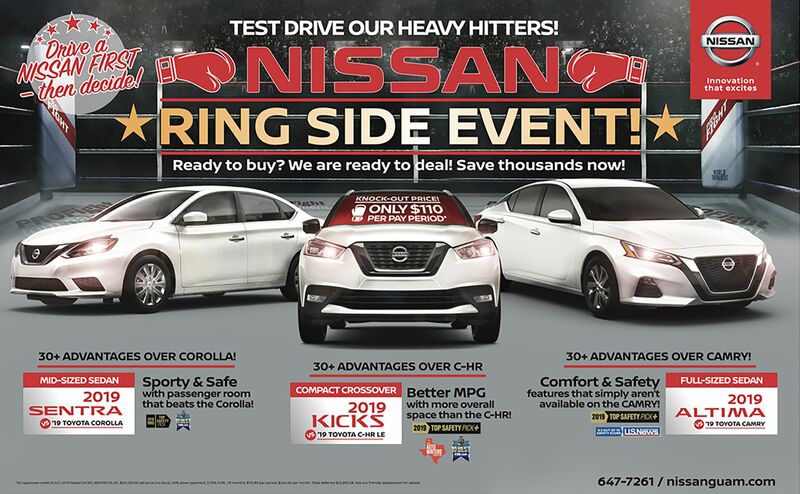 Whether you want to buy, lease, or service, Nissan Motor Corp in Guam is here to help.